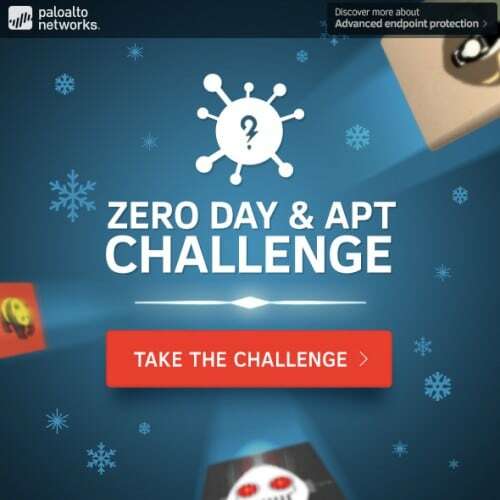 How well do you know your Zero Days and APTs? Take the challenge where knowledge of the worst threats out there could win you great prizes. Unit 42 investigates an antivirus app in the Google Play store, which our WildFire analysis cloud captured and identified as “Scareware,” that displayed fake virus detection results to scare users into purchasing a premium service and was downloaded over a million times. Register for Ignite and save $400 when you add the CNSE exam by January 31. In an effort to continue to drive the performance testing conversation toward the use of application-centric metrics, Palo Alto Networks partnered with Ixia and David Newman of Network Test to develop the first ever public-facing performance test that uses applications commonly found on your network. Learn more and see the results here. Check out this whitepaper to read about the shortcomings of proxies and find out how a next-generation security platform can provide faster, simpler and more comprehensive security. Need to set up a VM-Series NSX edition firewall? Use the checklist in the VM-Series Deployment Guide for step-by-step instructions. Researchers from Unit 42 attended ShmooCon 2015 this past weekend and participated in several great presentations. Here they recap a few of their favorites. Check out highlights of recent Palo Alto Networks coverage in China. Rick Howard explains why he thinks that the book “Cyber Warfare: Techniques, Tactics and Tools for the Security Practitioners” by Jason Andress and Steve Winterfeld is Cybersecurity Canon-worthy, and why “Inside Cyber Warfare: Mapping the Cyber Underworld” by Jeffrey Carr is a must-read for cybersecurity historians.